Download free posters for your personal or classroom use here: 8x10 in, 23x35 in. Or even better you can order preprinted posters, mugs, and T-Shirts from CafePress. 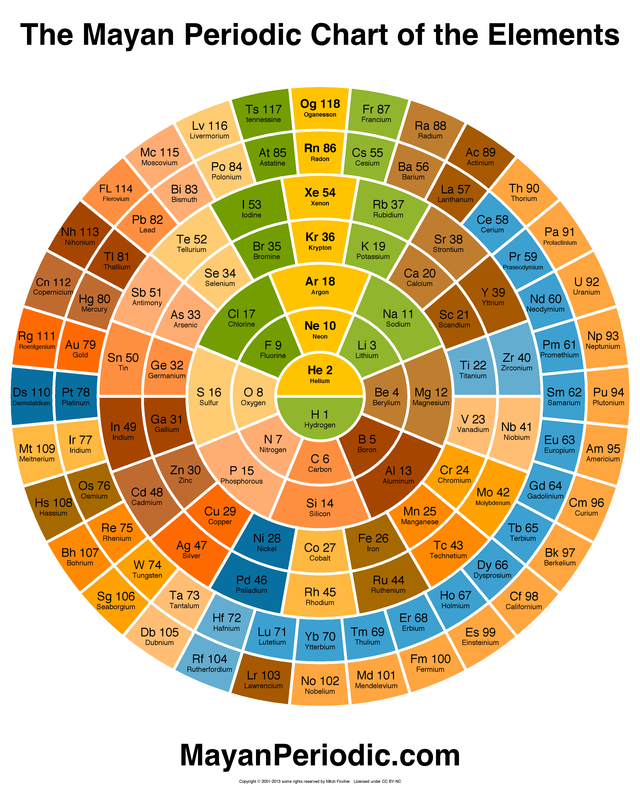 Why have an alternate version of the Periodic Table of the Elements? 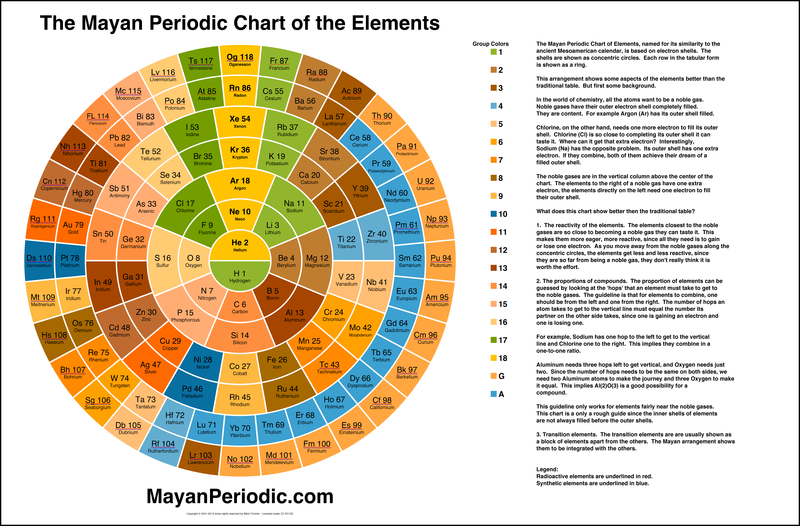 The Mayan Periodic Table of Elements, named for its similarity to the ancient Mesoamerican calendar, shows electron shells as concentric circles. Each row in the tabular form is shown as a ring. This arrangement shows some aspects of the elements better than the traditional table. But first some background. In the world of chemistry, all the atoms want to be a noble gas. Noble gases have their outer electron shell completely filled. They are content. For example Argon (Ar) has its outer shell filled. Chlorine, on the other hand, needs one more electron to fill its outershell. Chlorine (Cl) is so close to completing its outer shell it can taste it. Where can it get that extra electron? Interestingly, Sodium (Na) has the opposite problem. Its outer shell has one extra electron. If they combine, both of them achieve their dream of a filled outer shell. The noble gases are in the vertical column above the center of the chart. The elements to the right of a noble gas have one extra electron, the elements directly on the left need one electron to fill their outer shell. Ok, what does this chart show better then the traditional table? 1. The reactivity of the elements. The elements closest to the noble gases are so close to becoming a noble gas they can taste it. This makes them more eager, more reactive, since all they need is to gain or lose one electron. As you move away from the noble gases along the concentric circles, the elements get less and less reactive, since they are so far from being a noble gas, they don't really think it is worth the effort. 2. The proportions of compounds. The proportion of elements can be guessed by looking at the 'hops' that an element must take to get tothe noble gases. The guideline is that for elements to combine, one should be from the left and one from the right. The number of hops an atom takes to get to the vertical line must equal the number its partner on the other side takes, since one is gaining an electron and one is losing one. For example, Sodium has one hop to the left to get to the vertical line and Chlorine one to the right. This implies they combine in aone-to-one ratio. Aluminum needs three hops left to get vertical, and Oxygen needs just two. Since the number of hops needs to be the same on both sides, we need two Aluminum atoms to make the journey and three Oxygen to make it equal. This implies Al(2)O(3) is a good possibility for a compound. This guideline only works for elements fairly near the noble gases. This chart is a only a rough guide since the inner shells of elements are not always filled before the outer shells. 3. Transition elements. The transition elements are are usually shown as a block of elements apart from the others. The Mayan arrangement shows them to be integrated with the others. Radioactive elements are underlined in red. Synthetic elements are underlined in blue. Colors indicate the element's Group. This work is licensed under a Creative Commons Attribution-Noncommercial 3.0 United States License. You have my permission to use this graphic freely for any non-commercial use if you include attribution.